All customers assert and affirm that they are at least 21 years old. Benchmark retains the right to use reasonable means to verify a buyer's age and reserves the right to refuse to sell wine to anyone. All shipments require that the carrier verify the age of the recipient before delivery. In most locations, it is illegal for anyone under the age of 21 to attempt to purchase alcohol. Benchmark will comply with any legal entity in the prosecution of anyone under the age of 21 attempting to buy alcohol. Title to, and ownership of, all wine passes from seller to buyer in the State of California, and buyer takes all responsibility for shipping the wine from California to his or her home state. By placing an order, buyer authorizes seller to act on buyer’s behalf in arranging for transportation of the wine at the buyer’s direction. Alternatively, buyer may choose to pick up the wine at seller’s location, or make independent shipping arrangements. Seller makes no representation as to the legal rights of anyone to ship or import any wines, alcoholic beverages or other goods into any state. The buyer warrants that he or she is solely responsible for the shipment of wine and other goods purchased and for determining the legality and the tax/duty consequences of having the wine and other goods shipped to the applicable destination. Any shipment that is seized or destroyed due to violation of shipping laws or common carrier policy is not refundable. Benchmark will endeavor to follow specific shipping instructions. Such instructions should be indicated at time of purchase or Emailed to shipping@benchmarkwine.com within 1 hour of ordering. For large shipments, commercial trucking companies can be arranged. Customers may make arrangements with Benchmark to use their own common carrier account or pick up their order at our Napa address by contacting shipping@benchmarkwine.com. Depending on the circumstances, shipping charges will be collected at the time of order or the time of shipment. In cases where excess funds have been collected due to combining orders, changing shipping methods, etc., a refund for unused funds will be provided. Where funds previously collected do not cover the costs of shipping, an additional amount may be charged at time of shipment. Benchmark will hold customer orders for up to 30 days before shipping or until the next seasonally moderate shipping window. This service is provided at no charge as a courtesy for our customers. Wine so held remains the property of the buyer. Customers who choose not to ship within 30 days of order during a seasonally moderate shipping window will be charged $14 per case, per month for this service until shipment of the order. Benchmark reserves the right to move wine to an alternate storage facility and/or to charge additional fees for the storage of especially large orders over long periods of time. A street address at which an adult over 21 years of age or older is available during daytime hours to receive wine is required. We therefore recommend a business address wherever possible. Wine cannot be shipped to a P.O. Box nor to an APO address. It cannot be shipped via the United States Postal Service. If wine is not accepted on the first delivery attempt, Benchmark reserves the right to invalidate its quality guarantee as repeated delivery attempts may subject the wine to undue temperature stress. Benchmark guarantees that wine is in excellent condition, or the condition that is stated in its offer, at time of delivery if it is shipped by the method recommended by Benchmark, within the laws of the state into which it is shipped and is accepted on the first delivery attempt. If you receive a bottle of wine for which the condition is not excellent and which does not match the description, please notify us at warehouse@benchmarkwine.com within 24 hours. Benchmark cannot accept return of any bottle of wine that has been opened or altered nor any bottle of wine that has been out of its possession for more than 6 months. Excellent condition is based on the age of the wine. For bottles less than 20 years old, it is: base neck fill or better (fill within 3 cm of the bottom of the cork if the bottle has no shoulder), no sign of seepage or cork failure, relatively clean and undamaged label and capsule. Good wine color. Small nicks or marks on the label or capsule do not count against excellent condition. For wines over 20 years old, top shoulder fill or better (within 4 cm of bottom of cork if bottle has no shoulder), relatively intact label and capsule. Good wine color. Modest label or capsule nicks, tears, moisture stains, mildew stains, discoloration or oxidation does not count against excellent condition for wines of this age. Older white wines often take on a golden or orange color. Older red wines often take on a brick tone. Such color change does not count against excellent condition if it is consistent with the wine and the age. 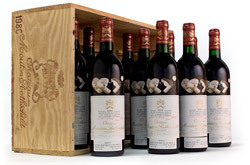 For high value bottles of older wine, we can provide digital photos. Please contact warehouse@benchmarkwine.com. If you make an error in ordering, please contact us immediately. There is a 5% fee for any order cancelled after the credit card batch has run (usually the evening of the same day). Orders are non-cancellable after 30 days from the date on the invoice, including pre-arrival wines and wines being held in our warehouse. Orders that are completed and shipped to an address outside of the United States are not cancellable or refundable for any reason. Benchmark sells some of its items on a pre-arrival or futures basis. At time of sale, an estimated arrival time will be provided. This is only an estimate. Due to circumstances beyond Benchmark's control, some items may be delayed beyond the expected date. Pre-Arrival items are subject to our Order Cancellation Policy, except for wines specially sourced. Then the cancellation policy does not apply and all sales are final. Please contact shipping@benchmarkwine.com with questions about the status of your pre-arrival items. Sales tax is charged for all orders shipped to addresses in California, including to storage facilities in California or picked up at our facility. Sales taxes may be charged for shipments into other states where such laws apply. Shipment to some countries outside of the United States requires the payment of duties by the recipient. Recipients outside the United States are required to know and comply with the laws of their countries. While Benchmark inspects each bottle of wine that it sells and endeavors to describe each bottle that it does not deem to be in excellent condition that might affect its drinkability, certain spoilage mechanisms are undetectable. Benchmark makes no specific representation of drinkability of any particular bottle of wine. Benchmark makes no representation of the suitability of any particular bottle of wine as an investment or for any other purpose. Prices and availability are subject to change without notice. Due to variations in condition and sourcing, different bottles of the same wine may occasionally be posted with different prices. Due to the real time nature of our website, items are not removed from our inventory until after successful 'check out'. Invoices, verbal and email confirmation notwithstanding, no item is guaranteed to be available until it has been pulled for shipping. With the proper credit application on file, customers may place orders on terms with check or wire transfer payment due 10 days after order is finalized. If payment is not received within 10 days of invoice date, that invoice is subject to cancellation without notice. Orders which are cancelled after 10 days from the invoice date, either by the customer or by Benchmark Wine Group due to non- payment, are subject to a 5% restocking fee. Benchmark Wine Group works very hard to accurately describe all products and provide world class service in all aspects of its operation. Please contact us immediately if you believe an error has occurred and we will attempt to rectify it or reach an amicable arrangement. Our maximum liability in any circumstance is limited to the purchase price of an item. This site is provided on an "as-is" and "as available" basis. No representations or warranties of any kind are made, express or implied, as to the operation of this site or the information, content, materials or products included on this site. You expressly agree that your use of this site is at your sole risk. To the full extent permissible by applicable law, this site's owner disclaims all warranties, express of implied, including, but not limited to, implied warranties of merchantability and fitness for a particular purpose. This site's owner does not warrant that this site, its servers, or Emails sent from this site are free of viruses or other harmful components. This site's owner will not be liable for any damages of any kind arising from the use of this site, including, but not limited to direct, indirect, incidental, punitive and consequential damages. Certain state laws do not allow limitations or implied warranties or the exclusion of limitation of certain damages. If these laws apply to you, some or all of the above disclaimers, exclusions or limitations may not apply to you, and you might have additional rights. Benchmark Wine Group values the privacy of its customers. We will not divulge your personal information outside of the company except in the unlikely event of a court order. Should you request your Email address be removed from our mailing list, we will do so immediately. Unless you request otherwise, we may occasionally allow our equity affiliates to let you know what they are doing. Benchmark Wine Group collects cookies on our Web site to capture information about page visits. This information is anonymous and we use this information internally to improve the content we provide to our visitors and to advertise to potential new customers. Information from the cookies is used to gauge page popularity, analyze traffic patterns on our site and guide development of other improvements to our site. For more information on how to control or delete cookies from the Benchmark Wine Group website, please click here. If you believe you received a solicitation or communication from any other entity as a result of registering at Benchmark Wine Group or signing up for our Email distribution, please contact us immediately.